This is the first in the series of updates to the process of turning my 3D Horizons virtual model into a real physical model. In case you missed it, check out the post showcasing the History of the Horizons Project for more info. As always, Retro-Replicas.net will have the latest project progress posts first. After Todd contacted me about turning my Horizons model into a real scale model, I re-opened my files and began inspecting my modeling to see where I had left off. I immediately noticed some inaccuracies in the landscaping around Horizons along with some sections of the pavilion itself being inaccurate. Originally, I had based my modeling of the landscaping from a Epcot master plan I had developed some years earlier. It was somewhat accurate considering the sources I had available to me at the time. But quite some time had passed since I first created this master plan. I have since collected a lot more reference material that now allows me to increase the accuracy of the model. 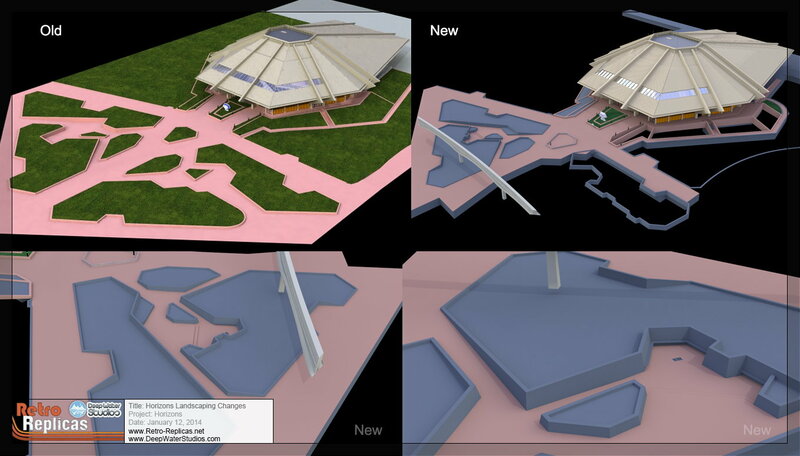 So my first step was to compare the existing model’s landscaping to some of my newer reference material. I quickly realized that while it was close, it wasn’t as accurate as it could be. You can see the old version was stretched and lacked overall detail. The stretching occurred because it was based upon satellite imagery. Lens distortion and the curvature of the earth often creates a distorted image. While these images are useful for some generalized reference, they too often lead to inaccuracies like the stretching seen in the old version. So they’re not very useful to build directly upon. Since my original modeling sessions, I have obtained some orthographic reference materials that not only corrected these distortions, it also provided some additional details that were lacking in the original model. 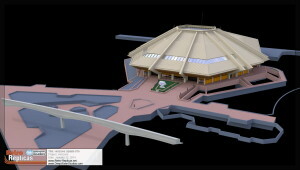 However, after consulting with some early photo references, I found that there was still a lot of detail missing. 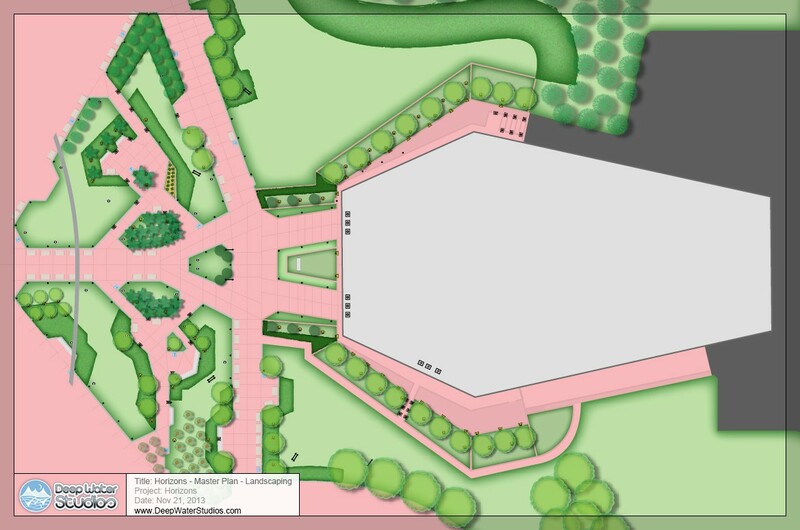 So I spent about three weeks gathering additional materials and carefully cross referencing and enhancing my photos to assemble a new master plan for the landscaping, lighting and other areas around the pavilion. I used the expansion joint lines in the concrete to help establish accurate placement of the corners and other major features of the landscape edging. 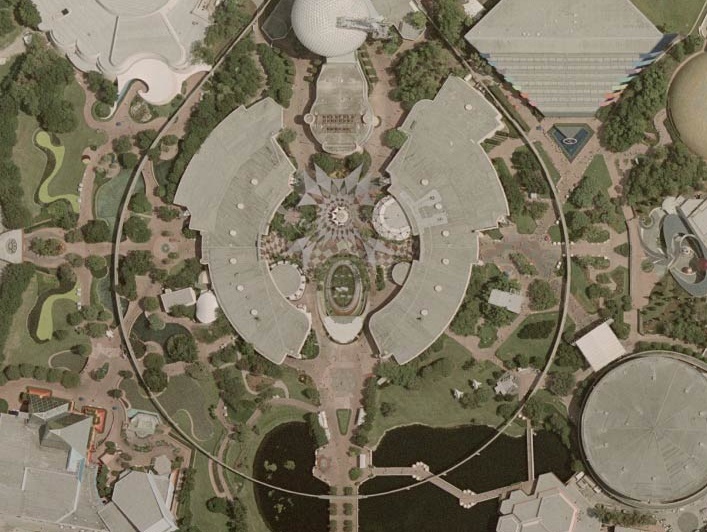 I feel I got pretty close to how the landscaping was in 1983/1984 when the Horizons pavilion was brand new. At this point, I realized that it would be quicker to simply start over on all of the landscaping modeling rather than try to correct the old model. There were/are still two areas where I’m “fuzzy” on however. It’s those two little pockets located North and South of the main path to Horizons where there were some benches formed into the landscaping itself. After I began modeling the new landscaping, I was able to figure out where some of the lines were more than likely located. Sometimes it’s easier to figure things out in 3D rather than 2D. I also discovered a few additional 35mm prints I had taken of this area back in the mid-nineties. The East side of Future World tends to be laid out in a very symmetrical, and angular fashion – a stark contrast to Future World West, and this made it easier to ensure things were being placed where they should be as everything tends to line up with something else. 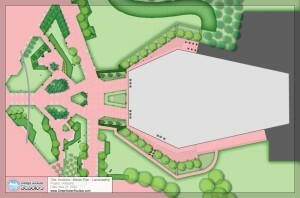 So I’ll be working on rebuilding the landscaping in front of and around the Horizons pavilion for a while as there is some pretty complex geometry going on there. The curbing consists of compound angles – not many of which end up being perfectly vertical and at right angles. The curbing in front of Horizons all contains a slight slope which, depending upon its elevation, affects the exact placement of the concrete expansion joints. Next Update – The Horizons Pavilion Building Updates. Stay Tuned!